For December 11th, Orthodox Churches on the Old Calendar commemorate the Saints listed on November 28. Martyrs Terentius, Vincent, Emilian, and Bebaia, by the sword. 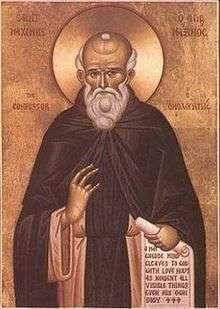 Venerable Nomon the Wonderworker, of Cyprus. New Hieromartyr Theophan (Ilminsky), Bishop of Perm and Solikamsk, and with him two priests and five laymen, martyrs (1918). Synaxis of the Saints of Georgia. St. Daniel the Stylite. (Church of the Transfiguration, Veliky Novgorod, 1378). 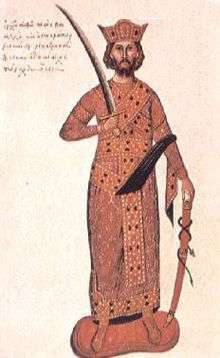 Medieval illumination representing Nikephoros II Phokas. At right, Nikephoros II Phokas and his stepson Basil II. Saint Luke the New Stylite, of Chalcedon (Menologion of Basil II, 10th century). ↑ The notation Old Style or (OS) is sometimes used to indicate a date in the Julian Calendar (which is used by churches on the "Old Calendar"). ↑ Their memory is recorded in the Synaxarion of Hippolyte Delehaye, and in Parisian Codex 1578. ↑ His memory is recorded only in the Lavreotic Codex B 4f. 133, where there is also a complete Acolouthia (service) with Canons. They were published by Louis Petit in Byzantinische Zeitschrift Vol. XIII (1904) pp.398-420 (see: Office inédit en l’honneur de Nicéphore Phocas); and by Dimitrievski in Kiev in 1911. ↑ Victoricus and Fuscian are described as early missionaries in France, martyred near Amiens. Gentian was an old man martyred while trying to protect them when they were arrested. ↑ Great Synaxaristes: (Greek): Οἱ Ἅγιοι Τερέντιος, Βικέντιος, Αἰμιλιανὸς καὶ Βεβαία οἱ Μάρτυρες. 11 Δεκεμβρίου. ΜΕΓΑΣ ΣΥΝΑΞΑΡΙΣΤΗΣ. ↑ Great Synaxaristes: (Greek): Οἱ Ἅγιοι Πέτρος καὶ Ἀκεψιμάς οἱ Μάρτυρες. 11 Δεκεμβρίου. ΜΕΓΑΣ ΣΥΝΑΞΑΡΙΣΤΗΣ. ↑ Great Synaxaristes: (Greek): Ὁ Ἅγιος Βαρσαβάς ὁ Μάρτυρας. 11 Δεκεμβρίου. ΜΕΓΑΣ ΣΥΝΑΞΑΡΙΣΤΗΣ. 1 2 3 4 5 6 December 11/24. Orthodox Calendar (PRAVOSLAVIE.RU). ↑ Great Synaxaristes: (Greek): Οἱ Ἅγιοι Ἀειθαλᾶς καὶ Ἀκεψέης οἱ Μάρτυρες. 11 Δεκεμβρίου. ΜΕΓΑΣ ΣΥΝΑΞΑΡΙΣΤΗΣ. ↑ Martyr Aithalas of Egypt. OCA - Feasts and Saints. ↑ Great Synaxaristes: (Greek): Ὁ Ὅσιος Δανιὴλ ὁ Στυλίτης. 11 Δεκεμβρίου. ΜΕΓΑΣ ΣΥΝΑΞΑΡΙΣΤΗΣ. ↑ Venerable Daniel the Stylite of Constantinople. OCA - Feasts and Saints. ↑ Great Synaxaristes: (Greek): Ὁ Ἅγιος Μείραξ. 11 Δεκεμβρίου. ΜΕΓΑΣ ΣΥΝΑΞΑΡΙΣΤΗΣ. ↑ Martyr Mirax of Egypt. OCA - Feasts and Saints. ↑ Great Synaxaristes: (Greek): Ὁ Ἅγιος Νικηφόρος Φωκᾶς αὐτοκράτορας τοῦ Βυζαντίου. 11 Δεκεμβρίου. ΜΕΓΑΣ ΣΥΝΑΞΑΡΙΣΤΗΣ. ↑ Great Synaxaristes: (Greek): Ὁ Ὅσιος Λουκᾶς ὁ Νέος Στυλίτης. 11 Δεκεμβρίου. ΜΕΓΑΣ ΣΥΝΑΞΑΡΙΣΤΗΣ. ↑ Venerable Luke the New Stylite of Chalcedon. OCA - Feasts and Saints. 1 2 3 4 5 6 7 December 11. Latin Saints of the Orthodox Patriarchate of Rome. 1 2 3 4 The Roman Martyrology. Transl. by the Archbishop of Baltimore. Last Edition, According to the Copy Printed at Rome in 1914. Revised Edition, with the Imprimatur of His Eminence Cardinal Gibbons. Baltimore: John Murphy Company, 1916. ↑ Great Synaxaristes: (Greek): Ὁ Ὅσιος Νίκων ὁ Ξηρὸς ὁ ἐν τῷ Σπηλαίῳ (Ρῶσος). 11 Δεκεμβρίου. ΜΕΓΑΣ ΣΥΝΑΞΑΡΙΣΤΗΣ. ↑ Venerable Nikon the Dry, of the Kiev Near Caves. OCA - Feasts and Saints. ↑ Great Synaxaristes: (Greek): Ὁ Ὅσιος Λεόντιος. 11 Δεκεμβρίου. ΜΕΓΑΣ ΣΥΝΑΞΑΡΙΣΤΗΣ. ↑ Great Synaxaristes: (Greek): Ὁ Ὅσιος Δαμασκηνός. 11 Δεκεμβρίου. ΜΕΓΑΣ ΣΥΝΑΞΑΡΙΣΤΗΣ. ↑ Great Synaxaristes: (Greek): Ὁ Ἅγιος Νόμων ὁ Θαυματουργός. 11 Δεκεμβρίου. ΜΕΓΑΣ ΣΥΝΑΞΑΡΙΣΤΗΣ. ↑ Dr. Alexander Roman. December. Calendar of Ukrainian Orthodox Saints (Ukrainian Orthodoxy - Українське Православ'я). 1 2 3 December 24 / December 11. HOLY TRINITY RUSSIAN ORTHODOX CHURCH (A parish of the Patriarchate of Moscow). 1 2 3 (Russian) 11 декабря (ст.ст.) 24 декабря 2013 (нов. ст.). Русская Православная Церковь Отдел внешних церковных связей. (DECR). ↑ The Autonomous Orthodox Metropolia of Western Europe and the Americas (ROCOR). St. Hilarion Calendar of Saints for the year of our Lord 2004. St. Hilarion Press (Austin, TX). p.92. ↑ Synaxis of the Saints of Georgia. OCA - Feasts and Saints. December 11/24. Orthodox Calendar (PRAVOSLAVIE.RU). December 24 / December 11. HOLY TRINITY RUSSIAN ORTHODOX CHURCH (A parish of the Patriarchate of Moscow). Complete List of Saints. Protection of the Mother of God Church (POMOG). December 11. OCA - The Lives of the Saints. Dr. Alexander Roman. December. Calendar of Ukrainian Orthodox Saints (Ukrainian Orthodoxy - Українське Православ'я). The Autonomous Orthodox Metropolia of Western Europe and the Americas (ROCOR). St. Hilarion Calendar of Saints for the year of our Lord 2004. St. Hilarion Press (Austin, TX). p.92. December 11. Latin Saints of the Orthodox Patriarchate of Rome. The Roman Martyrology. Transl. by the Archbishop of Baltimore. Last Edition, According to the Copy Printed at Rome in 1914. Revised Edition, with the Imprimatur of His Eminence Cardinal Gibbons. Baltimore: John Murphy Company, 1916. Great Synaxaristes: (Greek) 11 ΔΕΚΕΜΒΡΙΟΥ. ΜΕΓΑΣ ΣΥΝΑΞΑΡΙΣΤΗΣ. (Greek) Συναξαριστής. 11 Δεκεμβρίου. ECCLESIA.GR. (H ΕΚΚΛΗΣΙΑ ΤΗΣ ΕΛΛΑΔΟΣ). (Russian) 24 декабря (11 декабря). Православная Энциклопедия под редакцией Патриарха Московского и всея Руси Кирилла (электронная версия). 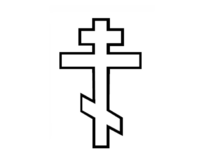 (Orthodox Encyclopedia - Pravenc.ru). (Russian) 11 декабря (ст.ст.) 24 декабря 2013 (нов. ст.). Русская Православная Церковь Отдел внешних церковных связей. (DECR).